This spring, frustrated by the lack of any good growing space in our yard, we decided to give a container garden a try. We bought up a whole bunch of pots to put everything in, got some good potting soil, and planted away. Once we were done, we planted a couple pots of tomatoes, a couple pots of cucumbers, a longish pot of green beans, a pot of green peppers, a longish pot of carrots, two pots of onions, and two large pots of potatoes. Last weekend, with the low temperatures in the forecast dipping below the 32 degree mark, we decided it was a good time to pull up the root vegetables, and pick anything that was ripe. Considering the few silly things we did, and the terribly hot summer we had, I think we did O.K. In the picture, you can see some of what we pulled up last weekend. I wasn’t quick enough on the camera trigger to get pictures of the carrots or peppers before they got taken into the house. Also not pictured are any of the cucumbers, beans, or tomatoes we’ve harvested throughout the summer, or any of 10 or so potatoes that we pulled out from the bottom of the potato bag in August. Overall, I’d have to say that I was slightly disappointed with the harvest. None of the onions grew to very good size. What cucumbers we did harvest were all seeds and no flesh. The heat really played havoc on most of the plants in the containers. There were several weeks where the plants really needed to be watered every night, but we were either gone, or didn’t get home in time to do it. I also made the mistake of planting a few too many plants in some of the containers, and I think they got crowded which stunted their growth. The quality of what we got, however, was pretty good. Fresh potatoes taste nothing like what you get from the store, they’re so buttery and sweet. The onions, while small, were very good as well. My wife made a salsa with some of the tomatoes and onions, and it was very, very good. I’ve already got a pretty good mental list of the things that I’ll be changing next year. We get such a short growing season here, that I either need to start the seeds much earlier in the house, or just spend the money and buy greenhouse plants when it’s time to plant. I’ll have to be careful to reduce the number of plants in the pots as well, to cut back on the crowding issue we had. I’m also thinking about building a few planters attached to the deck so I don’t have to buy any more pots. Of course, I could try and find some second hand pots as well. The soil we use may have to change a bit as well. The stuff we bought this year, while good potting soil, just didn’t seem to keep it’s consistency very well. Part of that may have been the need for more watering. I’ll be changing the mix of plants that I plant as well. The cucumbers didn’t seem to take to containers all that well, so I might cut those in half. I’d also like to add a few more tomato plants, and a few more varieties of peppers. We only planted green peppers this year, but I’d like to try some jalapeno, and maybe another variety of hot pepper. How did your garden turn out this year? Do you plant in a garden or in containers? For the first time, I’d say you did great. Anything other than ‘a bunch of dead plants’ is better than most would probably get the first year. I think the heat and rain issues were huge this year as well. Even if you repeated everything you did this year in a ‘normal’ rain and temp season, you’d have likely had much better luck. @Money Beagle – I agree, in a year with more normal temps and rain, I think they would have done a lot better. @Jeff – I didn’t track the money spent on it, but if I had, I’m sure that I lost money on it this year because of the initial outlay of pots and soil. Of course, those things are reusable, so the cost is spread out over several years. I think, mostly, I just had some grandiose plans of how much stuff I was going to grow this year, and I was disappointed more with the failure of it to live up to those standards. Given the conditions and such, I think we did pretty well. Here in the UK we’ve had one of the coldest, wettest summers for a generation. The rain has been mostly constant … although the weather did perk up for a couple of weeks during the Olympics 🙂 ! 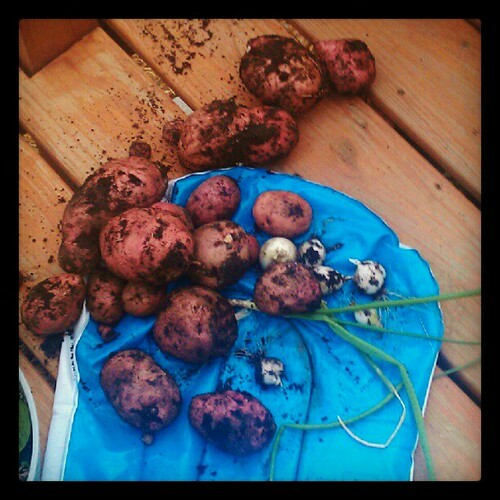 The potatoes have done okay, but most of the rest of the vegetables in our yard have been a complete wash-out. No tomatoes, no peas, no nothing. That’s a good start. Gardening for your own produce is like a gateway drug… to more gardening. If you’re constrained for space and stuck w/ containers, recommend going with self-watering containers – water just gets wicked upwards as needed. You’ll have much less soil compaction than with top-down watering. Managing the fertility is harder in containers, but it can be done. For my containers, I stick w/ that which can be managed well, and deliver good ROI (e.g. very expensive in stores): peppers, herbs, and anything that can grow well vertically on trellises like cucumbers and tromboncini squash. How did 2013 go? 2013 actually went very well. We were so busy throughout the summer that I didn’t get many pictures taken. Upgraded to some larger pots which seems to have helped a ton. Will be looking to do some more of that next year. Lots of tomatoes, peppers, cucumbers, and jalepenos! Potatoes didn’t do as well this year, but that was totally my fault.